Greece | If the beach is too full or far away, your own pool will promise undisturbed bathing fun under the Greek sun. 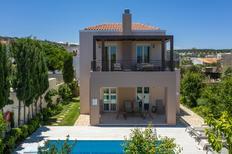 Architecturally attractive pool villa for eleven people near Kallithea. ​Rhodes | It can get hot under the Greek sun. Those who have a holiday home pool to call their own will be at a clear advantage. How about this windmill on the island Kea as a holiday home? ​Aegean | Holiday houses and apartments with direct sea view offer you the best views for your next vacation in Greece’s island world. 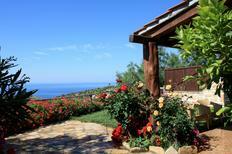 Holiday apartment for 5 people on an estate located on the steep coast. 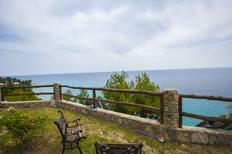 ​Peloponnese | The hand-shaped peninsula offers travellers a great deal. For example, holiday homes in panoramic location, which are a maximum of 100 metres from the water with a direct view of the Mediterranean. 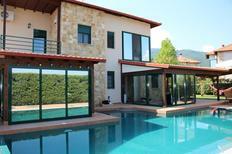 A holiday house in Greece costs on average USD 438 in the cheap travel period and USD 2,243 in the peak season per week. These details are of course in relation to the house and not per person as well as includes the obligatory additional charges. Holiday homes in Greece place you in the epicentre of the western world, the land that spawned myths and legends. Greece is the home of Odysseus, the archetypal traveller whose journey home took him on a tour of the Greek islands which are still a paradise enjoyed by visitors to this day. 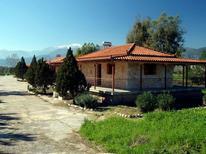 Experience the magic of this mythic country when you select a holiday apartment in Greece today. Ancient temples and the ruins of a once puissant world power are ubiquitous while the magic of serene fishing villages, where life passes just the way it did centuries ago, is also retained. Yet modern Greece also boasts an effervescent party scene and plenty of outdoor attractions to compliment its ancient sites. It goes without saying that a trip to Greece involves world class UNESCO heritage sites. Whether you are ticking the imperious Acropolis off your bucket list, discovering the seat of divination in ancient Delphi, or following in Hercules' footsteps on Peloponnese, you are in for a treat. Don't miss out on the ancient and sprawling Palace of Knossos, or ancient Delos, legendary birthplace of Apollo and Artemis. Many claim that Athens is the new hipster hangout in Europe and the city certainly has a very vibrant social scene. The majority of nightlife in Athens is within walking distance from Syntagma Square. Try the sophisticated TAF Bar situated in attractive 19th century buildings which host ephemeral exhibitions of painting, photography and plastic arts. Opposite a Russian Orthodox church is the convivial wine bar By The Glass, which offers speciality wines, flattering lighting and light meals. Party at Island which supplies ocean views and sushi. However, it's not just Athens and Thessaloniki that boast a happening modern lifestyle. The islands are as vibrant with cosmopolitan energy as their coves are with marine life. Mykonos for instance boasts a plethora of celebrated bars and clubs that attract equally famous clientele. World class DJs animate parties beneath the stars, complete with chic cocktails. Party on beaches like Paradise and Paranga where bars overlook the glittering Aegean. More laid back party people gather on the island of Ios, especially in the beach resort town of Mylopotas. That's saying nothing of Kos, the most famous island for nightlife in the Dodecanese. Greece is also a trove of natural wonders. Almost 500 Natura 2000 sites gush with picturesque waterfalls and surge into precipitous peaks. Come to mountain climb, kayak or jet ski but also discover the fossilised forest of Lesbos and spot hundreds of bird species in the forest of Dadia and the deltas of Evros and Pinios. Scuba dive on shipwrecks, swim with sea turtles and dolphins, or sail away like the legendary Odysseus on the brilliant blue ocean. Sun kissed orchards, sapphire waters and flower-filled olive groves are the building blocks of Greece's healthy and delicious cuisine. Fruity olive oil is liberally drizzled over many a meal, while creamy, crumbly, salty feta cheese varies from region to region. Turkish spices and Italian influences infuse Greek food with a wide palette of flavours. Visit the volcanoes on the islands of Nisyros, Methana and Milos. The former is the youngest in Greece, though dormant, and its crater is seven metres across. Methana has not one but more than thirty volcanoes, which heat thermal springs and make for idyllic hiking. Marvel at Milos' strange geology before lounging on Greece's pristine beaches. For watersports, locate your holiday home in Greece near Kefalonia's Myrtos beach, or plunge into the turquoise water at Mykonos' Super Paradise Beach. Shipwreck Bay on Zakynthos is famed for its clear water and wrecks, while the award-winning Canal D'Amour beach on Corfu is known for its lovely grottoes. Greek food is so delicious that it has become world-famous. Dig into traditional taramasalata with a squeeze of lemon as you gaze out over the glimmering water. Dine like a Greek God on dolmades, also known as stuffed vine leaves and be seduced by the cinnamon aroma of cheesy, unctuous moussaka. You'll never taste fish this fresh as the aroma of the grilled catch of the day beckons you to many a seaside taverna. Take advantage of the availability of grilled and marinated octopus or just plonk a dollop of delicious local honey in some cooling Greek yoghurt and melt blissfully away. 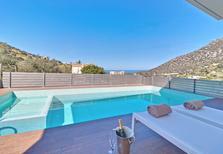 Holiday apartments in Greece position you perfectly for exploring Crete's 4000-year-old Minoan history. Whether you are hiking through Europe's longest gorge or discovering the birthplace of Zeus, Crete supplies endless wonders. Laze on idyllic beaches, snorkel in secluded coves, or cycle through the orchards that adorn Lasithi. Soak yourself in Turkish bathhouses or celebrate with locals at a traditional festival. 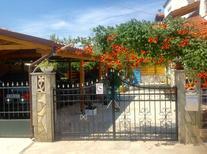 Holiday homes in Greece also offer the delights of the island of Corfu, another one of Odysseus' stopping points. The rugged scenery of this jewel is coupled with Venetian palaces and colonial influences like ginger beer and cricket. Discover ancient artefacts and ruins at the royal retreat Mon Repos. A lesser known Grecian treasure is the northern region of Chalkidiki. Vineyards overflow with grapes while crystalline waters invite to snorkelling, sun-lounging in the glittering sands. Dive with sea anemones in Nikiti, fly through pine scented forests on your bike in Kassandra, and discover strange rock formations in the Petralona Cave. It couldn't be simpler to arrive at holiday homes in Greece from within Europe. Flights to Athens, Crete and Rhodes depart from most major European cities several times a day. From Athens airport, you can take advantage of 24-hour buses and taxis to and from the city centre, while Crete and Rhodes transportation run until late at night. 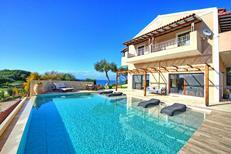 Temperatures and visitor numbers soar between May and August at holiday apartments in Greece. In the shoulder seasons of April, September and October, the weather and sea are still warm, but you'll find the beaches and attractions more sparsely populated while some internal transportation run reduced schedules. November through March are the low season, when temperatures and prices drop. Greece is especially easy to visit from the UK, Germany and Austria, since it also uses the Euro. Expect to bargain in markets, and be sure to stock up on cash before visiting remoter regions since ATMs are often out of order. A small tip is appreciated at restaurants and stewards and bellhops expect a few euros in recompense for their efforts.